ProjectComment has been an active comment group for 9+ years to give you the constructive comments you deserve! …to nurture together – educate, engage, elevate. I'm new! Where do I start? What do I do? What is not a Constructive Comment? If you cannot find what you are looking for, please note us! ProjectComment membership is automatically approved. We accept every kind of artist and all kinds of art. We don’t care if you are an expert, or a complete n00b, at commenting! To join, you do not have to be an amazing artist or commenter. We believe everyone can write a constructive comment if they are willing to try and learn. Welcome to ProjectComment! Where you start and what you do is entirely up to you! There are many places for you to start, and many things for you to do. No one way is right or wrong. ProjectComment encourages you to ask yourself what you really want from the group. Do you want comments? Do you want to give comments? Do you want support for your comments? These are just some of the questions that you could be asking yourself. Once you have your answer, check out our visual help guide for new members to find where you can start and what you can do. As a group, we encourage you to join us whenever you can. We understand that commenting takes time - you may not have a lot of time, or be active. That is completely fine with us! Many of our projects allow you to come and go as you please, but some of our projects do require more commitment, such as Gallery at a Glance, Comment Tag, etc. ProjectComment’s projects can range from workshops, features, contests, actual projects and much more! Everything we have is to encourage you to give and get the comments you deserve, as well as aid you in your commenting. Each project has its own rules, guidelines and information, as well as its own ‘Project Manager’. The Project Manager is the person to go to with any questions, suggestions or concerns about anything related to the project, as they, essentially, manage the project. If you are not comfortable talking to the Project Manager, please note the group instead. ProjectComment’s rules and group standards ensure the efficiency and fairness of our projects for everyone. Your understanding of our rules and group standards is very much appreciated. Comments made on behalf of ProjectComment should be constructive. What is a Constructive Comment? For the comment to really help an artist, a rough measurement is a comment of 7 consecutive lines as seen on a desktop computer. As screen sizes differ, ProjectComment counts 7 lines as 200 words minimum of deviation-related content. Please do not interpret lines as ‘sentences’ or lines that should be broken up. 7 consecutive lines means that the lines should follow on from each other - one after the other. To really help an artist, we also expect constructive comments to use What is a Constructive Comment? as a guide and basic foundation for your comment, not to be used or interpreted as the bare minimum required by ProjectComment. For further support, please review our Constructive Commenting: Guiding Questions (questions to consider when writing constructive comments) and Comment Hall of Fame (examples of constructive comments). In addition, while ProjectComment recommends you include greetings, introductions, conclusions, well wishes, disclaimers, etc. to round off your constructive comments, these are not counted as deviation-related content, which means they are not counted in the 200 words minimum requirement. To distinguish between comments made on behalf of our group, and comments made on behalf of other groups, please indicate you are a member of ProjectComment in your constructive comment. Please note that emoticons will not show in Critiques written on the Critique Platform. Use of Signature - Please edit your Settings and put :devprojectcomment: in your Signature. Please take note that Comment Tag enforces a 100-word minimum on deviation-related content. If you intend to sign up to Comment Tag, please be committed to giving a comment. A constructive comment is a comment that serves a useful purpose. For many artists, constructive comments help them improve their artwork. For others, constructive comments offer insight, depth, new perspective and more. Ultimately, constructive comments encourage critical thinking of both the artist and the commenter, and they embody our values as a group. Justified with specific examples, evidence and explanations. This is done through 'why', 'how', 'what', etc. For example, what does this particular element create in / add to / contributes to...the piece, the subject, the concept, etc.? How and why does the element or artist do this? Please take note that the above is to be used as a guide and basic foundation for your comment, not to be used or interpreted as the bare minimum required by ProjectComment. The above should help you expand upon your own comment. For further support, please review our Constructive Commenting: Guiding Questions (questions to consider when writing constructive comments) and Comment Hall of Fame (examples of constructive comments). In addition, while ProjectComment recommends you include greetings, introductions, conclusions, well wishes, disclaimers, etc. to round off your constructive comment, these are not counted as deviation-related content, which means they are not counted in the 200 words minimum requirement. A line or a few lines - it is difficult to be constructive when writing so little. An Itemized List - or any list at all. Generic - feedback that could be applied to any artist or any art. Useless - no insight, no depth, no improvement suggestions, no justification, etc. Rude / Offensive / Insulting - constructive comments can be given (i.e. phrased) constructively. Brief Introduction - first impressions and feelings over the artwork. The well-done elements – main idea, examples and explanation of what was done well. The points to improve - what elements could be improved and how to do so. Brief Conclusion – supporting message and encouragement to the artist, thus ending the comment on a positive or hopeful note. RED: The main idea of each point for further development later; something general to introduce your point and what you will say. GREEN: Examples used as 'evidence' of the main idea, thus helping the artist to spot different elements or areas of improvement. No 'evidence' can cause confusion for the artist. BLUE: Further guidance by suggesting ways to improve, specifically focusing on how. Simply stating what needs to be improved is not enough to help the artist. PURPLE: Justification and explanation of the effect on you (the commenter/audience) by the different elements (red) and examples (green). This is important in highlighting whether the audience (you) was able to understand the artwork in terms of meaning and concept. Check out our Comment Hall of Fame, which features amazing constructive comments! If you would like to submit Literature, we would really appreciate it if you could comment on Literature so that it is fair. Submitting Literature? Give a constructive comment on a deviation in our Gallery, preferably from the same folder you would like to submit to yourself. Once you have commented, please give us a link to your comment as seen here OR post on our front page OR note the group with a link to the deviation you would like to submit to the group. We will review your comment. If the comment is constructive, your submission will be accepted into the group and will not be moved until you get a constructive comment back. What do our folders mean? Give & Get - If you submit to Give & Get 1, you will give 1 comment and get 1 comment. If you submit to Give & Get 2, you will give 2 comments and get 2 comments. Lines - If you submit to 6-7 Lines, you will give 6-7 Lines and get 6-7 Lines. If you submit to 7+ Lines, you will give 7+ Lines and get 7+ Lines. Please respect our system. For example, if you are commenting on a deviation in the 7+ Lines folders, please post a comment of 7+ Lines. If you have made and linked us to two constructive comments, you will, of course, get two constructive comments back. Comments must be constructive, on deviation-related content. What is a Constructive Comment? If you would like to submit Literature to our Gallery, we would really appreciate it if you could comment on Literature so that it is fair. Our members will not be commenting on more than two standard pages of Literature. Therefore, we ask that you refrain from submitting more than two pages or, if you insist on submitting, please do not expect our commenters to comment, fully, on the entire piece. Our members cannot comment on any chapter after the first (e.g. Chapter 2 or 22) with understanding of happenings that occurred in previous chapters. Therefore, if you would like a comment on a piece that comes after the first chapter, it will be approached as a standalone piece. Our members may not know the fandom of a fanfiction piece. Therefore, please bear in mind that our members may not be able to comment on the content. If you want to get comments by giving comments, that is awesome! ProjectComment tries to foster an environment of reciprocity, of fair exchange and balance, so that those that give comments get comments back of the same caliber. How does it work to get comments by giving comments? Well, we have projects that encourage you to give comments first. Once you have commented and linked us to your comments, your piece will be commented on by other members – just like what you did for someone else. Gallery at a Glance - If you sometimes feel a little lost on your artistic journey, if you would like a fresh pair of eyes to help you pinpoint where your strengths and weaknesses are, or if you would just like to know the impression that your art leaves on other viewers, come join us for a round (or two)! Comment Tag - This is the only project where you get a comment first, prompting you to give a comment to the next person. Comment Tag is a fun game where every comment given means a comment received (or every comment received means a comment given). Weekly Commenting - We bring the commenting to you (via Notes), once a week, every week, so that you can submit unlimited deviations to our Gallery. Please note that Give & Get Comment Projects guarantee you comments. Commenting takes time, especially if you are posting constructive comments. Therefore, we understand if you just want to get comments without giving any (although, we would like you to pay the kindness forward by giving comments too). More Exposure - Not exactly a ‘Comment Project’, this project aims to bring you more exposure by featuring you on our front page and in a news article. 100 = 2 Constructive Comments of 6-7 Lines each. 150 = 2 Constructive Comments of 7+ Lines each. Please note that some Get Comment Projects do not guarantee you comments. Without our awesome commenters, ProjectComment wouldn't be the group it is today. It is with that belief that we have initiatives for you all to interact and support one another as commenters, but also as artists and members of the DeviantArt community. Nominate a Commenter + Win 100 Points! - Awarding one awesome member 100 every two weeks, with art features of other great commenters. You have come to the right place if you would like support for your comments and/or commenting in general! 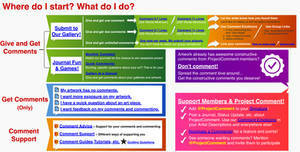 If you are open and willing to learn, we are more than willing to help and guide you through the realm of commenting. Note Us - Not sure whether a comment is ‘constructive’? Don’t want to offend anyone with your comment? Stumped at what to say? Note us! If you are interested in improving your commenting to help others, consider contacting us for suggestions, advice and more. Our Constructive Commenting: Guiding Questions should help you in writing constructive comments by providing you with guiding questions for you to answer. Our Comment Hall of Fame also provides examples of constructive comments we value in the group. We appreciate every and any support to help artists on DeviantArt get the constructive comments they deserve. As they say, the more, the merrier! Post a Journal, Status Update and more about ProjectComment. Invite and encourage others to join in on the commenting fun! Use our Comment Emoticons in your journals, artist descriptions and anywhere else you see fit! If you see someone stating they want comments, mention ProjectComment to them and invite them to participate! and comment on our journals, create discussions, share your thoughts and opinions! Link to ProjectComment in your Signature! Donate here, where every received goes back to our members and the community in the form of contests, projects and other events. If you would like to go one step further than a commenter or member, consider becoming an admin at ProjectComment. We are in need of volunteers to help us manage the group behind-the-scenes. Those who are interested in our open positions should send us a note with the position you are interested in and an explanation for your interest. Please ensure that you can demonstrate activity within the group before application. We will not be accepting applications from people who do not have a history of making a difference in ProjectComment. Thanks for the invit! but my english is so bad I don't understand all the rules very well, but I'll try to do my best! I would like to give comments, but I am no ready to get comment now. How should I do it? Sure, no problem! If you'd like to give comments, feel free to browse the group gallery. Everyone who submitted there would appreciate a comment! We generally encourage our members to write more than 200 words, but if you have no intention of getting comments yourself, you're welcome to comment however you like. I saw - it's awesome! Thank you so much. Thanks for the invite! This will definitely help me with posting art and since I'm not very much active due to me doing art behind the scenes, I'll do my very best on being active on DeviantArt and thanks for the invite. However, I do post random crap. But 200 words, though? I don't even write that much with 200 words! That's awesome! It takes time, practice and effort, but that's what it takes for a variety of things, including art. Thanks for the invite! I’m not that much of a writer (English is my weak spot) but I’ll try to follow this. I might not be that active in this group only because I got my own things to do. Normally I just give positive feedback but sometimes I babble like this and write crazy paragraphs. Also, I have awefull grammar skills. accept me now. Because I babble nonsense practically 24/7. No worries at all! Thank you for your support! Indeed! Commenting and art are close buddies. And, like art, it takes practice, time, effort and more to get good and be comfortable with commenting. I have written a comment, and would like to get it reviewed before submitting, can anyone explain in further detail how to link my comment correctly? If you'd like your comment reviewed before you submit, you'll have to copy and paste that comment into a note to the group, since it's not posted, right? It is posted! It's a critique and can either be viewed on my page or I can link it if you'd like! Yes, please! I'd just like to know if that's a good enough comment. Apologies for the late response. With regards to your comment, it's great how you were specific with the weaknesses. However, more balance is encouraged. For example, more paragraphs on the strengths, how the artist did things effectively, why something is a strength, etc. will help balance out the more critical remarks. Generally, the group believes starting with a positive, then negative, then positive is a good way to go about things. It's no issue! I am very thankful for the response and explanation of how to improve on critiquing artworks. I will continue to try my best and balance the commentary out more carefully! I need to absorb all of this.... I definitely want to participate I got a request on my more "professional leaning" account and I want to keep that one kind of clean and neat for when I open it for prints. But I really want the support---been trying to find people who give good and helpful feedback for ages. But...I must admit. This is a lot and feels a little confusing. And I am trying to organize so much right now. I want to keep tabs and jump in when I feel ready. Of course - take your time. Let me know if you have any questions, suggestions, concerns or anything else. I'm glad! Let me know if you have any questions, suggestions, concerns or anything else! Thanks for the invite, I took it. Sometimes I give short comments, but if a piece is less than three years old and I can find something to like about it, I usually comment because I figure the artist still cares about it or isn't embarrassed by it. I'm also hoping to improve my own traffic because I get very few comments, but a handful of faves. I'm a victim of fave and runs and it's getting old! Thanks again for this opprotunity, I'll do what I can! Thank you for your support! Let me know if you have any questions, suggestions, concerns or anything else! Thank you for the invite I will try my best to give honest and good opinions whenever i can as I'm not a very active person on DA, but i do try. I'll make sure to at least put the group tag into my signature if i have the time. Thank you for this group invite! I would gladly join and attempt to give my opinion in what i can to help inspire and improve the motivation of artists of all ages and at the same time get inspired by them in return and do my best to improve my art so that i bring them something good!!! Awesome, thank you for your support! Let me know if you have any questions, suggestions, concerns or anything else! I really admire the fact that you want to help all kind of artists! it's really sweet! But I'm a bit nervous about commenting things that mention "Improvement" I'm never really good with my words, and sometimes just mess the whole place up. but I'll try my best! If you'd like support, feel free to note the group with what you've written before you post it so we can provide feedback on your feedback! I'm sure that, with practice, it will get easier - as it often does with time, effort and more. I seriously admire that you want to help people to get more attention! I will try to follow all of the rules and be a great member! Right now I'm lazy to read all of that, but I will! Comment Hall of FameWelcome to ProjectComment's Comment Hall of Fame! The comments in these articles are only some of the best comments made on behalf of ProjectComment, from members to members. References of ProjectComment have been removed from these comments, but links to these comments are featured. The comments, commenters and artists are not 'perfect', but are featured as inspiration. It is up to you to find aspects you would like to use in your own comments, though we have included artists' responses to some of the comments to help you find those aspects. These commenters have made a difference to these artists by providing a comment that is constructive. Please join us in recognising the efforts of both artist and commenter. Another Big Feature! (part 1)I've got introduced to a lot more amazing artists since the last time I did a feature, so I'll separate this one into 2 parts. Check out my previous feature as well: BIG FEATURE! Another Big Feature! (part 2)I've got introduced to a lot more amazing artists since the last time I did a feature, so I'll separate this one into 2 parts. !! !Winners feature of our art contest!! !ChibiYvi and I have chosen the winners of our contest!!! Here are the offical journals for the winners and all perticipans!!! Thank you all for joining our contest!!! This is really a beautiful masterpiece! We love the colors and the way Stacie-Love drew our beloved fairy friends Yuri and Sayuri! The expression, the background and all the little details are full of love! This magical piece has enchanted us! Toyhou.se codes: Where to get them?Comments asking for a code will be instantly hidden (unless they reply to someone offering codes). I have NO CODES. Comments offering free codes are still accepted and appreciated! Since so many people are looking for a way to obtain a sign-up code for Toyhou.se and they can be a bit annoying to track down, here's a way to find them that works most of the time. Please note that I don’t have any codes, so I can’t provide you with any. First off, NEVER give any money, points, art, or designs for codes! They are worth $0,26. I calculated it. They are virtually worthless and easy to obtain for free, don't let any shady users scam you outta your money, art, or designs. #03 How to Format your CommentsProjectComment is a Group of many projects centred around comments, but, more importantly, constructive comments. Every week, one admin from ProjectComment will write an informative article on commenting that will hopefully be useful to you! Please help support us by the article and contribute your thoughts and opinions on the matter. This article aims to show you how to format your constructive comments, and why you should format them in the first place. 'Formatting' in this case means making your comment more readable with a few simple steps. Many of us simply write down the good and bad things we notice about an artwork, along with ways to improve the bad ones, which can lead to a unstructurized outcome, which makes understanding the comment and following the advice given harder. Why should I format my comments? dAWishingWell is a community-based group on deviantART and only operates on deviantART. Our primary goal is to give a venue where community-oriented and other policy-abiding community members can not only make a wish but have their deviantART-related wishes granted, be featured and recognized for their talents and participation, and for these deviants to have a safe atmosphere to gather and share artistic and charitable interests. We are not employees of DeviantArt! We rely on the generosity of our members and watchers to grant wishes. Starting today, we're launching an ongoing initiative aimed at increasing community spirit by identifying deviants who are good at reaching out to others, and matching them with new deviants who might benefit from a kindred guide. Joining a new community can sometimes feel daunting -- like you’re on the outside looking in. But we’re working on ways to make it easier for new deviants to meet others and get involved with the things that matter most to them. If you're a deviant who often interacts with new deviants, you may receive a notification every so often. Currently, there isn't a way to opt-in to getting these notification, but you can increase your chances of receiving them by interacting with new deviants. The "New Deviants" section of the today page is a great place to start.